Dr. Ferullo and the downtown dentist team are dedicated to their St. Pete dental patient’s oral health. We take pride in developing a strong partnership with all of our patients to obtain optimum dental health. Our goal is to help you acquire and maintain healthy, trouble-free teeth and gums. We provide cutting edge laser dentistry for gentle dental care and want to help teach you more about taking care of your teeth. The focus at our office is treating the cause of your problems instead of just treating the symptoms. Working together we can achieve optimal dental health for you and your entire family. Poor oral care can lead to a variety of dental and medical issues such as cavities, gum disease, bad breath, infection, bone loss, heart disease, strokes and more. You need to do your part at home along with regular checkups and cleanings to prevent these problems as well as to protect your overall health, oral health and smile. Dr. Ferullo offers the following St. Pete dental tips to all of his patients for optimal health. Brush teeth – brush your teeth properly two times a day for two minutes. Floss teeth – clean between teeth daily with floss. Brush your tongue – brush your tongue to remove bacteria and keep breath fresh. Rinse with mouthwash – rinse your mouth with an ADA approved mouthwash daily. Make sure to use an ADA approved toothpaste and floss. Replace tooth-brush or bristles regularly – worn and frayed bristles won’t do a good job of cleaning teeth. Eat a balanced diet – including limiting sugary between-meal snacks. Visit Dr. Ferullo regularly – for professional cleanings and oral exams. Using a proper brushing technique is an important part of oral hygiene. Dr. Ferullo recommends to all his St. Pete Dental patients, that they use a soft-bristled brush that should be placed at a 45-degree angle to the gums. 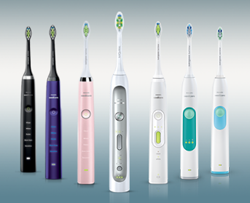 For a superior deep cleaning brush, our office also endorses the use of a new level of care with sonic technology provided by Philips Sonicare Electric Toothbrushes. These products provide superior cleaning power for a deep clean and superior plaque removal. Below is a video of how to use these products for the best results. Dr. Ferullo has been providing St. Pete Dental Lifetime Partnerships for over 25 years and many of our patients have been coming to see him for decades. We build relationships that last and our patient testimonials show it. We go out of our way to make your visit pleasant, provide the most up to date treatments, can complete your services as quickly and efficiently as possible. Call us today at (727) 822-8101 to get started on your lifetime partnership today!